At the beginning of the semester I wrote about my fascination with data visualizations. One map visualization that I have spent time digging through is the New York Times map called “An Extremely Detailed Map of the 2016 Election.” I appreciate the detail of this map however, what I find it is lacking is what all of this data means. The 2016 election was a wake up call for everyone across America. We are more divided than ever before. In order to make progress, we must first understand what happened in 2016 and why. For my final project I would like to create a visualization about whose votes essentially mattered in the 2016 election. This will identify where our election system is flawed and why it is important to fix these issues. This it not a story about why your vote doesn't matter, rather understanding how our system is built to favor certain votes over others. In the end, the 2016 election came down to the voters in three states, Wisconsin, Michigan and Pennsylvania. While this seems like a small amount, it is hard to grasp how this even happens and how few votes this is compared to all of the eligible voters. Hopefully, my visualization with help people to grasp this concept and learn what areas of our voting system need re-thinking. 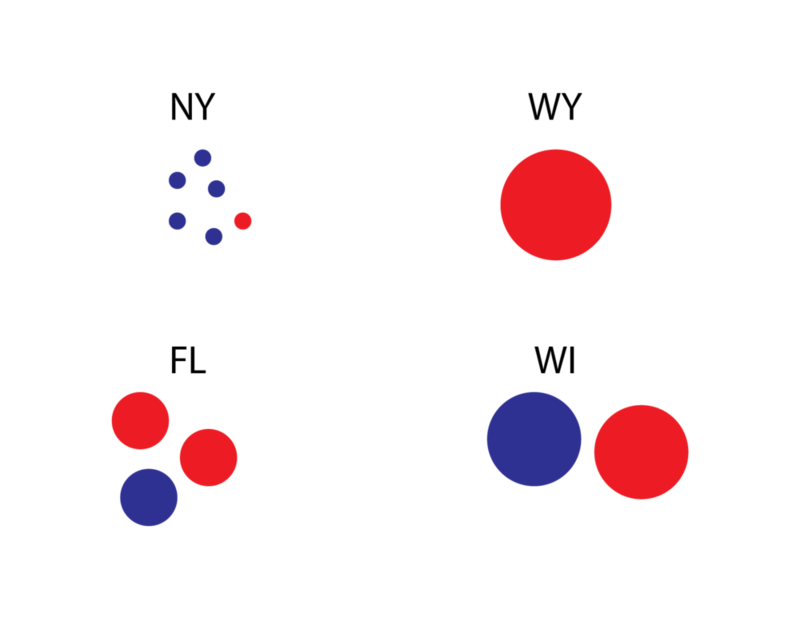 The visualization will begin with a representation of all of the eligible voters (Figure 1). Each dot will represent, a certain number of voters. Next I will eliminate all of the people who did not vote and those who voted for third party candidates (Figure 2). This will leave 58% of the dots from Figure 1. I am choosing to focus mainly on the main party voters here so I have chosen to eliminate third party voters at this stage. In the current “first past the post system”, a vote for a third party candidate is considered a wasted vote so I am choosing to representing it as such here. Next I will divide the remaining dots into each state based on the voters per state (Figure 3). This figure shows the dots under their state name, however I would like to represent these dots over a state map at this point. Once the votes are represented by state, I will weight the size of the dots based on how many electoral votes each state has (Figure 4). I will make this calculation using the total state population divided by the number of electoral college votes. At this point you will visually be able to see what votes matter more than others based on the size of the dots. Next I will color the dots base on party (Figure 5). Lastly, I will remove the vote for the candidate in each state that lost (Figure 6). If I have time, I will continue by eliminating the excess votes that the candidate who won received in each state. This last feature will highlight the fact that the way our system works today a candidate does not need to receive a majority of the vote to win, instead, they need to receive the most votes. At the end, I would like the user to be able to click on two stages of the visualization and compare them. The most telling comparison will likely be the first and last stages where you compare all of the eligible voters to how many votes really mattered. I think the most challenging aspect of this project is going to be to get a clear movement of all of the dots between phases. I need this animation to be smooth in order for it to not get in the way of the messages I am trying to convey. Throughout the brainstorm process, I was focused on two areas, data visualization and the ml5 poseNet library. The following are some other ideas I had that involve the ml5 poseNet library. Using poseNet.js to visualize connections between people. When you hold hands with someone a beat shows up and you can move with the other person and display the moving connection. Creating a project with finger shadow puppets. If you make a bird shape with you hands, a real animated bird shows up on the screen, etc.